Karl Rahner, S.J. (R) with Bishop Patrick Ahern (L) on a visit to America Magazine in the 1970s. This interview was originally published in America on March 10, 1979. America: Father Rahner, you've had 75 years of human experience now. Would you be able to tell us what the major turning points in your life have been? Father Rahner: I don't know whether I've had major turning points in my life, or whether the brook or river of my life has always gone more or less in the same direction, so that now the time has gradually come for this river of time to flow into the sea of eternity. You know, I grew up in a Catholic family. It was a family with seven children, middle-class, and on my mother's side, but also on my father's. Catholic as a matter of course, without being at all sanctimonious. After the "Abitur" which comes at the end of German secondary education, I entered the Society of Jesus at 18. There I did my studies and have had my life's work. Reading Karl Rahner: Twenty-five years after his death, Rahner's works still illuminate. So there weren't really occasions to experience major, radical changes or upheavals. In fact, I'd probably say just the opposite. The remarkable, unusual, but obvious thing about my spiritual life was that all the new situations somehow revealed and brought home the one same ancient and genuine future—by pointing ever and again toward God and His life. Naturally, there's an outer course of life: youth and age, studying and teaching, writing and lecturing and preaching, meeting all sorts of people. Think of the Weimar Republic, the Nazi period, the 30 years after the Second World War and so forth. But all these different times, that you naturally do experience in a certain way intensely and alertly, still didn't cause any upheavals in my own life, even though they were all so different. Basically, they made clear ever and again the one same reference to the incomprehensible mystery that we call God. The remarkable, unusual, but obvious thing about my spiritual life was that all the new situations somehow revealed and brought home the one same ancient and genuine future—by pointing ever and again toward God and His life. Now, I admit that other people, authentic Christians, too, can experience life differently. In other words, a person's life can include historical turning points, demands, new ventures and hopes for the future, disappointments and so forth. And, according to God's providence, they can and have experienced these things more intensely and radically than I have. But my own life, even with all its natural share in the cultural life of the last 60 or 70 years, has run in a certain sense monotonously. I don't mean it in the sense that every life should be that way. But that's the way it was with me. Even with all the changes of our time, the external circumstances of my own life were to a certain extent quite regular. I've been a Jesuit since 1922. So I've been a Jesuit for 56 years. As far as the external style and conditions of that life style go, the life of a Jesuit, at least for myself, was really relatively homogeneous. The work of a theologian probably has its own natural development, its new realizations, etc. But I would say that my life was characterized rather by a certain monotony, a regularity, a homogeneity that comes from a person's turning toward the final theme of theology, of religious life and also of human life in general—which comes from the one, silent, absolute but always present reality of God. My life was characterized rather by a certain monotony, a regularity, a homogeneity that comes from a person's turning toward the final theme of theology, of religious life and also of human life in general—which comes from the one, silent, absolute but always present reality of God. America: In your life, you've met people both inside and outside the church. Who, for example, influenced or impressed you especially? You've already mentioned your family. Father Rahner: That's another hard question. If you ask me only about people I've met outside the church, then first of all I would have to make some reservations—that I can't activate my memory so quickly for such a question. Naturally, there are interesting people outside my order and the church whom I've met and who have indeed made a certain impression on me. Martin Heidegger should, of course, be mentioned first of all. And then there are naturally other people whom I've met and who are relatively well-known figures. I have come to know Heinrich Boll personally, and Golo Mann and Ernst Fromm. I knew Ernst Bloch and was at least once in Karl Barth's company. Among theologians, I also knew Friedrich Gogarten. If I could test my memory now more closely and exactly and longer, I would certainly want to name others. And if I did look more closely, then I would not want to be ungrateful and underrate the influence and the significance of all these people, nor the influence of poets and philosophers one knows only through books. But if, in fact, I ask myself, for example, whether Heidegger exercised a great influence on me, then I would say that I am not exactly sure. Naturally, I am grateful that I was able to sit in his seminar with a few others for two years. Certainly, I learned a variety of things from him, even if I have to say that I owe my most basic, decisive, philosophical direction, insofar as it comes from someone else, more, in fact, to the Belgian philosopher and Jesuit, Joseph Maréchal. His philosophy already moved beyond the traditional neoscholasticism. I brought that direction from Maréchal to my studies with Heidegger and it was not superseded by him. Perhaps it depends on the monotony of my life or on a somewhat monotonous self-interpretation when I say that I have not actually met major figures who have turned my life around or changed it radically. I don't consider this as an advantage, but just recognize it as a fact, and maybe even a regrettable one. Even the teachers I had in my order, for example, teachers who were certainly industrious, learned, well-read and educated, seemed to me at least to be relatively second-rate people for whom I was not so enthusiastic as a disciple would be for his master. I cannot say that in my Jesuit philosophy and theology I met a master who, so to speak, overwhelmed or deeply stirred or inspired me. That could be my own fault, and perhaps unfortunate. But, there again, I would say: That is how it has been. I would not really say that I have met the great master to whom alone, in one way or another, I was bound in a blazing discipleship. Naturally, I know that people like Heidegger or Ernst Bloch, or else a Nobel Prizewinner like Heinrich Boll, and even an Ernst Fromm, were men of greater ability, greater teachers and more creative thinkers than my teachers in the order. But even among such people, I would not really say that I have met the great master to whom alone, in one way or another, I was bound in a blazing discipleship. So I am, if you want to put it that way, like every other human being, the product of my environment, but really more the product of a diverse, a perhaps anonymous and symmetrical environment that worked on me from different sides. America: With respect to the Society of Jesus, would you say that Ignatius of Loyola has molded your own religious experience? Father Rahner: Naturally, I don't want to say all too much about that, because it isn't really anybody else's business. But I do think that in comparison with other philosophy and theology that influenced me, Ignatian spirituality was indeed more significant and important. There, too, to be honest, I cannot say that individual Jesuits, spiritual directors, retreat masters and so forth made an overpowering impression on me. In fact, I would honestly admit, if one may be allowed such a confession, that I made eight-day retreats, for example, with the late Father (Augustin) Bea, who later became a cardinal, and with Franz Hürth, who was an important moral theologian in Rome, but that I found both these men, who really were important in the church, disappointingly traditional. But I think that the spirituality of Ignatius himself, which one learned through the practice of prayer and religious formation, was more significant for me than all learned philosophy and theology inside and outside the order. The spirituality of Ignatius himself, which one learned through the practice of prayer and religious formation, was more significant for me than all learned philosophy and theology inside and outside the order. Of course, there were also some men in the generation of Jesuits just before me whom one should mention and who were already, in fact, forerunners or initiators of a breakthrough from the philosophy and theology of neoscholasticism. I'm thinking now of men like Peter Lippert, or even more of Erich Przywara, perhaps also Dunin Borkowsky. In this connection, I should perhaps say also that without ever having had the intention of becoming a researcher in the field of spiritual theology and its history, I did read a relatively large amount of major spiritual literature. Then later, just before the Second World War, I edited an expanded translation of Marcel Viller's book, Asceticism and Mysticism in the Time of the Fathers; this was a translation of Viller, but I did write half of it myself. In addition, you know, I also wrote an essay on the mysticism of Bonaventure. And so, I grounded myself fairly well in the original sources of Jesuit spirituality. Also, for that matter, in Teresa of Avila and John of the Cross and so forth. In short, even though I remain a poor sinner, I think that the great spirituality of the church in general and especially of the Jesuits had a larger and broader influence on me than did my immediate teachers both inside and outside the order. America: Do you think that your pastoral concern in theology also grew out of this reading and research? Father Rahner: I have already said quite often, and I think that it's correct, that however abstract and schoolmasterly my theology may have been, it still has had in the end a pastoral, ministerial inspiration. I mean, I have never or at least very seldom done theology for theology's sake, like "art for art's sake." It's not so much because I was able to be very active pastorally. Naturally, especially when I was younger, I did preach relatively often. In Innsbruck, for example, I preached every Sunday for 10 years. When I was younger, I gave retreats relatively often—not for everyone, for example, not for students in secondary schools, but still, in fact, for a variety of people of very different sorts: priests, members of religious orders, religious women, educated groups, etc. I also did pastoral work, though I don't say a great deal of it. In Lower Bavaria during the war, I helped out in the ordinary parish ministry. From 1939-44, during the war, I was a member of the Pastoral Institute in Vienna, where Msgr. Karl Rudolf, who has long since died, had developed and built up a type of diocesan pastoral institute that was scarcely heard of before, I think, at least in central Europe. In earlier times, the chanceries were really more or less bureaucratic administrative centers. By founding and developing and organizing the Pastoral Institute, Rudolf shifted the diocesan administration's center of gravity from the bureaucracy to central institutions of living pastoral care. And in that year, I was also one of his modest co-workers who went through this. I hope and I think that my theology was never really "art for art's sake" in the way that was usual in scholarly theology, at least in dogmatic theology, before my time. In short, both from a personal, existential concern, but also from such an understanding of pastoral needs, I hope and I think that my theology was never really "art for art's sake" in the way that was usual in scholarly theology, at least in dogmatic theology, before my time. You see, I certainly don't want to take anything away from Martin Grabmann. He was a devout priest who also thoroughly understood pastoral tasks and worked to meet them as well as he could. But a Martin Grabmann, an Artur Landgraf and so forth were, in fact, theological scholars who lived more or less in the conviction that systematic theology in its proper sense could not make any more great progress. Landgraf said this directly, that all scholarship, properly speaking, at least in dogmatic theology, concentrates on its earlier history, so that research into this history is important, attractive and interesting but, in fact, has no very great significance for preaching the Gospel today, or for today's spiritual life and so forth. In other words, in those days, at least in systematic theology—I'm not talking now about moral theology or pastoral theology or catechetics and so forth—in properly dogmatic theology, one pursued, in fact, a retrospective theology out of historical curiosity. Of course, I don't want to say that I never did anything like that myself. The 11th (German) volume of my Theological Investigations, with my essays on the history of penance, certainly shows that. But this type of learned, retrospective theology for its own sake was really always foreign to me. And as a result of a certain spirituality, of what compelled me in a present and existential way, and of pastoral or ministerial work, I did see, I believe, new and important tasks that were also posed for a systematic, speculative theology. America: You have also treated the theme of hope and the future fairly intensively and have expressed yourself rather optimistically on that score. Would you characterize your theology on the whole as optimistic, or perhaps rather as realistic? 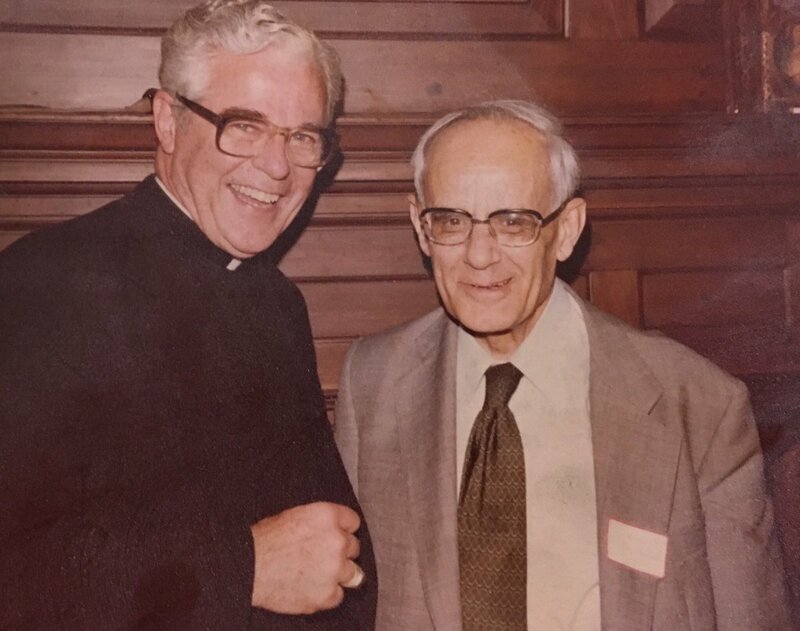 Father Rahner: Under certain circumstances, you can naturally find veins or levels in my actual theology that have a philosophical or, better, an optimistic vein. For example, when I spoke earlier about the hominization of the world and so forth, or when I said that nature on its own terms is no longer simply the environment for humanity but a construction site for a world which humanity itself builds. In statements like these, it could naturally happen that other points of view of a more pessimistic sort, if you will, were not sufficiently noticed. But I would say that being conditioned by time in that way, and perhaps also by temperament and so forth, is not so important. It's not so important for this reason: In contrast to a modern, liberal, Marxist futurology, I have always emphasized, first, that the final and absolute future is God as God Himself, and secondly, that this absolute future can only be reached through the medium of death. And so, over against a liberalistic, futurological optimism of an enlightenment sort, there was always the Christian conception of a pessimistic world that is in a certain sense given over to death and permanently ensnared in guilt. Over against a liberalistic, futurological optimism of an enlightenment sort, there was always the Christian conception of a pessimistic world that is in a certain sense given over to death and permanently ensnared in guilt. America: I would think myself that "realistic" would be a better word—better than optimistic or pessimistic. Father Rahner: If you place each and every thing, every knowledge and every reality, at least basically and intentionally under the sign and seal of God as the mystery which is never set aside, then, naturally, optimism, pessimism, realism are all very indeterminate and imprecise criteria. What does it mean to be realistic? To be realistic means only to accept reality unconditionally just as it is. Now, if in the first place this same incomprehensible God belongs to this reality as its ground and encompassing power, and secondly, if this incomprehensible God is really accepted in faith, hope and love as giving and sustaining the meaning of our lives, and if, thirdly, this acceptance of the absolute mystery fundamentally always occurs in an unconditioned surrender to God through death, and only in that way, then what really should we mean, then, by realism or optimism or pessimism? I never wanted to be a pessimist of despair. I never wanted to be an optimist who overlooks the mystery of death for the individual and for the world. If someone then wants to call this other view realism, all right. But this realism is certainly not the realism of a narrow-minded banality and a superficial life. On the contrary, a person is realistic in my view only if that person believes in God and lets himself or herself fall into that tremendous, unfathomable abyss. So what does realism really mean! America: Are there themes, or perhaps a theme, Father Rahner, that concern you especially today, something that you would still like to work out? Father Rahner: That's hard to say. One or two years ago, perhaps, I really had the intention of writing something about a possible orthodox teaching on apocatastasis (the doctrine that all free beings will eventually share in the grace of salvation). To be sure, previous theology has considered the existence of eternal damnation and hell an already given fact or one that was absolutely certain to occur, in the same sense that it considered heaven and eternal beatitude certain. Today, I think, not only I myself but other theologians, as well, would speak differently, without wanting to represent a heretical teaching on apocatastasis. Within my own historical time, I must indeed reckon absolutely and unconditionally with the possibility of being eternally lost. But despite certain texts in the New Testament, I do not know with absolute certainty that this eternal loss occurs for any particular people. And I can say, I hope, without being able to know this now for sure, that God has in fact created a world in which all questions indeed find a positive solution. Within my own historical time, I must indeed reckon absolutely and unconditionally with the possibility of being eternally lost. But despite certain texts in the New Testament, I do not know with absolute certainty that this eternal loss occurs for any particular people. So I would still really like to have written something about such a teaching on apocatastasis that would be orthodox and acceptable. But it is a very difficult matter. You would probably have to study and answer once again new questions in the history of dogma and especially also in exegesis; you would also have to consider questions of exegetical and philosophical interpretation. For all that, my time and strength may not be sufficient anymore. And so, I don't know how it will work out. In any case, the 13th (German) volume of my Theological Investigations appeared in the fall (of 1978), and so did a small book written together with (Father Karl-Heinz) Weger. This year, also, since it is already more or less ready, the 14th (German) volume of Theological Investigations will appear. And so, for the time being, even without this question of apocatastasis, I have enough to do. America: Among your own writings, is there any text or work that is particularly important for you yourself? Father Rahner: First of all, I think, one should distinguish this question with respect to my so-called more devotional, spiritual writings and then my more systematic theology—although in my own case, in fact, perhaps more so than with other theologians, there is no exact boundary between these two. Let us just take the difficult problem of the prayer of petition. I think I probably handled that in my own case for the first time in my small devotional book, On Prayer. And there, in fact, I probably put things theologically in a way not really very different from those texts which are more systematic. The little book, On Prayer, is therefore for me at least just as important as those more scholarly matters—even though it is "only" a devotional book. Then you might also say that, from another point of view, it is not a certain book but certain ideas that are very important to me. And here I am certainly not thinking only of what people commonly call Rahner's "transcendental theology," but also of other questions that basically seem important to me. Take, for example, what I have called "the logic of concrete individual knowledge in Ignatius Loyola," about which (Father Harvey) Egan in America has also written, I think. Such matters are important, I believe; they are new to a certain extent and really could still have consequences for other questions and groups of problems, even where people do not yet see this so clearly. Once, for example, I wrote an essay in which I tried to show that this same logic of concrete individual knowledge is basically and typically Jesuit, but that it had no place whatsoever in the traditional type of fundamental theology written by Jesuits. But it could have played an important role there. And so, the scholastic Jesuit theologians did not use the greatest and most important riches from the Spiritual Exercises to fertilize their own theology. Instead, they presupposed some sort of essential and rational theory of knowledge as the only possible one and didn't realize that St. Ignatius had taught them something entirely different. And so, there are questions like that in my work. But if you ask me whether I have a sort of favorite book, then I really don't know. You could say, the earliest books are the best, you know. Or you could say, no, that's not true, a late work like Foundations of Christian Faith is the most important. But then, I don't know that either. America: Would it be too much to ask at the end. Father Rahner, how you yourself would identify the center of your theology? Father Rahner: That's hard to say. The center of my theology? Good Lord, that can't be anything else but God as mystery and Jesus Christ, the crucified and risen One, as the historical event in which this God turns irreversibly toward us in self-communication. So, in principle, you can't name just one center. The center of my theology? Good Lord, that can't be anything else but God as mystery and Jesus Christ, the crucified and risen One, as the historical event in which this God turns irreversibly toward us in self-communication. Naturally, all geometrical means of representation are inadequate. But even apart from that, we have to remember that humanity is unconditionally directed toward God, a God which we ourselves are not. And yet, with this God, who in every respect infinitely surpasses us, with this God Himself, we do have something to do; God is indeed not only the absolutely distant One, but also the absolutely near One, absolutely near, also, in His history. It is precisely because of this that God as this center at the same time makes Jesus Christ the center. I don't know what you should call that. Why should I decide, so to speak, for one center that I can characterize with one word? I don't think you can do that. America: So you look on theology, in fact, as "systematic" but not as a final system? Father Rahner: No, no, no! One should never stop thinking too early. The true system of thought really is the knowledge that humanity is finally directed precisely not toward what it can control in knowledge but toward the absolute mystery as such; that mystery is not just an unfortunate remainder of what is not yet known but rather the blessed goal of knowledge which comes to itself when it is with the incomprehensible One, and not in any other way. With other words, then, the system is the system of what cannot be systematized. And now, let's stop there. America: Thank you, Father Rahner. Leo J. O'Donovan, S.J., is president emeritus of Georgetown University, Washington, D.C., and director of mission for Jesuit Refugee Service. At the time of this interview, he was associate professor of systematic theology at Weston School of Theology, Cambridge, Mass. This interview with Father Rahner in Munich was conducted and translated by Father O'Donovan.